From this article, you can learn how to extend system partition on Windows 2003, 2008, 2012, Windows 7/8/XP/Vista without reinstalling system. Download IM-Magic Partition Resizer Server to extend system partition without reinstalling when it runs low disk space on Windows Server. It is a common problem for almost all Windows users that system partition is running on low disk space. You will feel helpless when you find that you are unable to install any new program or upgrade applications because system partition doesn't have sufficient free space. In this situation, you can use partition software IM-Magic Partition Resizer Server. This partition software provides solution for partition resizing by extending partition, shrinking partition and moving partition without reinstalling system on Windows computer. Download, install and launch IM-Magic Partition Resizer Server on your computer. Right click a partition that has enough free space and select "Resize/Move". Move the arrows to add the unallocated space to system partition and then click "Apply" button. "After installing system on C drive, there is only 18GB free space on the C drive. Now, C drive only has 8GB available space since I have installed some programs on this drive. I tried to format the C drive to free up space, but Windows was unable to complete the format. 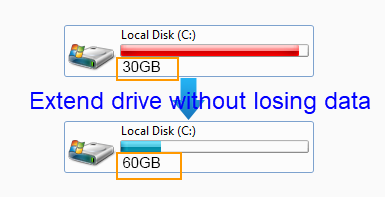 How can I add more space to C drive when it is running out of disk space?" If you want to format system partition, you need to reinstall operating system. Windows disables you to format a system partition like formatting other data volume, because formatting will affect the operating system. Therefore, you usually need to reinstall system and reformat the C drive to free up space to fix low disk space problem. Before reinstalling and reformatting the partition, you had better backup important data stored on the C drive to another partition or other storage media. Diskpart cannot extend a system partition, so Windows Server 2008 and Windows 2012 have made breakthrough which allows you to extend system partition under Disk Management. You need to generate unallocated space right behind the system partition and then you can easily get system partition extended without system reinstalling. If there is no contiguous unallocated space or if the Server OS like Windows 2003 doesn't have the function or extending volume under Disk Management, you can use IM-Magic Partition Resizer Server, which also enables you to extend system partition without reinstalling system. This partition software can extend system partition on Windows Server such as Windows 2003, 2008, 2012, Windows SBS 2003, 2008, Windows Server 2003 R2, Windows 2008 R2 and Windows 2012 R2, etc. RAID 5 is dynamic disk, which is built by three hard disks with same capacity at least. If C drive is running out of disk space on RAID 5, you can reformat disk and reinstall system and then add new hard disk to rebuild the RAID array. IM-Magic Partition Resizer Server can work on RAID 5 array to extend C drive system partition without reinstalling system or reformatting the disk. If there is free space on other partitions on RAID 5, you can run the software to squeeze some unallocated space to extend C drive. If there is no free space on RAID 5, you just need to add a new disk and the new added disk will display as unallocated space. You can run the software to add the unallocated space to C drive to get it expanded. Windows PC users that use Windows 7/8/XP/Vista operating system can also extend system partition when it is lacking of free space. Disk Management under Windows 7/8/Vista allows users to extend disk volume as long as there is contiguous unallocated space behind the partition you want to extend. Besides, you can also rely on IM-Magic Partition Resizer Free to extend system partition without system reinstalling. 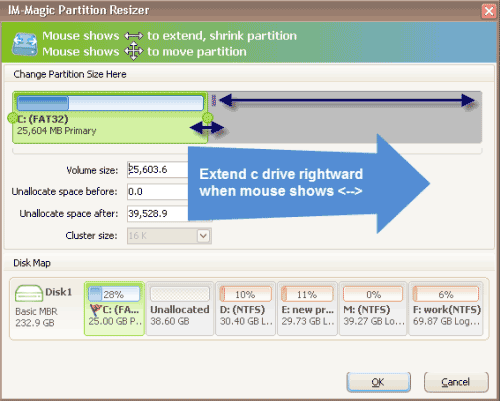 The IM-Magic Partition Resizer Free is free version of partition software for Windows home users. This partition software also supports virtual disk, so you can extend system partition on Windows Server 2003 VMware, 2008 VMware, 2012 WMware, etc.